Facebook recently announced the launch of Facebook Home, a new widget that will replace the homescreen on your Android device. Facebook Home will deliver you a people centric experience called “coverfeed” – a continuous stream of updates, full screen photos, and notifications that will be accessible all the time, without having to unlock your device or tap or swipe anything. During the launch event, Mark Zuckerberg spoke about a shift from creating an app centric experience to creating a people centric experience, saying that “With Home, you see your phone through people, not apps.” After all, according to Facebook, the average mobile user looks at their phone 100 times a day, and that 20% of time is spent on social apps. At first, this people-centric theory makes sense. And from a pure user experience perspective, if we’re using social apps so frequently, it does make sense to try and bring that content to the forefront and not force the user to drill into an app every time they want to engage with that content or person. However, I think we need to take a step back and consider the very people that Home is going to centralize our experience around. I’m not a huge Facebook user. Mainly, I use it because it’s how so many of my friends communicate with me. Naturally over time, we’ve all accumulated more “friends” than is actually representative of the people we truly care to keep up with. At the same time, we’ve also become “friends” with (or “liked”) sometimes hundreds of brands, sometimes intentionally but mostly by accident. The result? Our Facebook newsfeeds are cluttered with content from people and brands that we don’t actually care about. The quality and relevancy of the content in the Facebook Newsfeed is on a rapid decline. It is often the equivalent of a supermarket magazine stand that’s filled with about 80% trashy tabloids and 20% decent publications. This is not a jab at Facebook, but just the reality of the content that’s on Facebook (at least from my perspective … unless I’m the only one and my friends could just be really spammy??!?!). It’s so disturbing. I just don’t understand. It seems so void of soul and meaning. Not that every piece of technology needs to have soul and meaning. But, come on! It’s downright creepy – at first, I thought it was a joke (yes, seriously). I’m sure there are plenty of amazing examples of how Facebook has really helped to, well c-o-n-n-e-c-t people in the world with some actual meaning. Why didn’t they use some of the content from Facebook Stories? Stay with me for a second … Gmail is used for a lot of soul-less and meaningless purposes such as, well SPAM. But, Google figured out how to position Gmail as a tool that connects people and the Dear Sophie ad is one of my favorite ads of all time from Google – it has purpose, meaning, and it connects on an emotional level (to learn mor about that, read the book Emotional Branding). 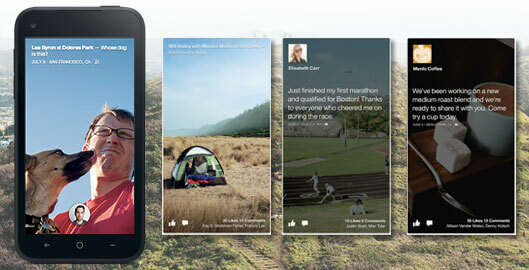 Will Facebook Home somehow filter out content from brands? Will it include advertisements or suggested posts? Will it intelligently only show me content from people that I regularly engage with? Or will it be my Newsfeed delivered to me on my homescreen? In one of the videos promoting Facebook Home, the voiceover says, “we use our phones to connect with the people we care about” … but do we? Are they really the people we care about? Do I really care about the photos of people on vacation in Mexico who I’ve only met a handful of times? Yes, of course I know the responsibility is on me to manage who is actually my “friend” on Facebook. But, stay with me. It seems as though the definition of “friend” has changed when you look at it through the lens of Facebook. Honestly, Facebook really doesn’t work well unless I have a lot of friends. If I only had say 20 friends on Facebook, I doubt there would be enough volume of information for me to keep returning to the site and app every day – every hour. I’ve done demo’s before and of course, demos are always filled with the ideal content experience – I completely understand that. Of course, we design for the extremes of too little, too much, etc. But seriously, I would have loved to be in the design sessions for Facebook Home to talk through the bigger issues at hand. I understand the team’s goal to bring content closer to me at all times and the value of a people-centric experience. However, one big question I would have considered is: will bringing people to the forefront of the experience make us finally realize that maybe, the people and brands we’re connected to on Facebook are not truly representative of the people and brands we truly care about? Or, have we as a society reached a point where we simply filter out the content that we don’t care about anymore? Is Facebook so truly engrained into our lives now that we are actually addicted to this information? I am all for being more connected and sharing information. And, I certainly don’t have the answers! But, in the back of my mind I am always wondering about the quality of those connections and the quality of the information that we are allowing into our brains. What is this doing to us socially, emotionally, spiritually, psychologically, physiologically? In her book Quiet: The Power Of Introverts In A World That Can’t Stop Talking, former corporate lawyer turned Susan Cain writes about how as a society, we undervalue introverts and we try to turn them into extroverts through environments in our schooles, workplaces, and other places. As a result, the art of solitude is being lost. More importantly, ideas are being lost. History shows that many of the great inventors and ideators were introverts and spent a great deal of time on their own. Susan claims that a key driver of a bias toward extroversion was in a movement from a Culture of Character to a Culture of Personality, which she talks about in an interview with Fast Company. Facebook has certainly made us more connected. But again, I have to question the quality of those connections and the quality of the information that comes from these connections. More importantly, I have to question the impact that this constant connection has on our time for solitude. Does solitude even exist anymore? Does being physically along actually equal solitude given that our “friends” are always in our hands? Will Facebook Home force us to re-evaluate who our “friends” are, or has Facebook forced us to re-define who a “friend” is. More importantly, what is the impact of constantly being connected and what is it doing to our society and culture?